Congratulations to Angel B. of Elizabeth, NJ! You've won the Verizon Nikon D3000 Giveaway! Celebrate the Holidays with a New Nikon D3000! 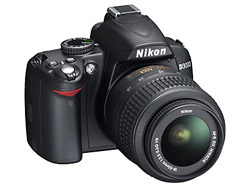 Just in time for the holidays, Verizon is sponsoring a giveaway of a Nikon D3000 10.2 megapixel digital SLR camera. Valued at $549, the Nikon D3000 makes capturing high-quality family photos a cinch. However, sharing those treasured holiday memories can be a tedious task without a fast reliable Internet connection. Remember, your Internet connection isn’t really fast unless it’s fast both up and down. And it’s the upstream speed that makes photo-sharing quick and easy. Consider this: With the FiOS upload speed of 15 Mbps, you can post 20 digital photos (approximately 50 megabytes) to your Facebook or your favorite photo-sharing site in about 25 seconds, while it takes a cable 2 Mbps upload speed more than 3 minutes. When you start talking about posting home videos of 500 MB or larger, the speed advantage of FiOS over cable becomes even more dramatic. Another factor contributing to a “dragging” Internet, which in-turn makes uploading photos a chore, can be that cable Internet is shared by hundreds of users. FiOS Internet is shared by no more than 32 users for a consistently fast Internet experience. What’s the bottom-line? Know your Internet speeds and, more specifically, make sure your upload speeds are fast, consistent and reliable. Without a doubt, Verizon’s top-rated FiOS Internet offers the fastest upload speeds available, making memory sharing quick and easy. To learn more about FiOS and find out if it is available in your area, visit www.verizon.com or www.factsonfios.com. Want to check your Internet speed? Test your real-time connection speed here and then compare it to Verizon FiOS. To enter the giveaway, simply subscribe to the Techlicious newsletter during the contest period using the "subscribe" box on this page or any other page on the site. All new subscribers to the newsletter are eligible for the drawing. If you are an existing subscriber and would like to enter, add a comment below using the same email address you subscribed with. Maximum of one entry per person. The giveaway will end at 11:59pm on December 17, 2009. I’m a Subscriber. And I would love to win! I would love to enter! I’m a subscriber! I would really like to win this camera. I love Techlicious because it’s… TECHLICIOUS!!! And I like free stuff, too. This would be very nice if I won. I would like to give this to my daughter as a gift. I’m a subscriber already and would like to enter! I am a subscriber. I would like to be able to give a camera like this to my granddaughter, who is in college and is interested in photography. I’d love to win this for my husband as a Christmas gift. He’s gone back to college and taking a photography class next semester and this would be great because at this point he is going to borrow a camera because we just can’t afford it right now. He’d be so wonderfully suprised if I could give him this. Thanks so much for this opportunity. This would be nice to take along on my family Christmas trip. Add me, too. I’m a newsletter subscriber! Please enter me in the contest. I am a subscriber. I like taking pix of the family! I am a subscriber. I would love to win this camera! Thanks! I subscribed. Would love to win. I’m already a subscriber. I love this camera! I’m a subscriber and I’d love this! I would love to win this great camera. I am already a subscriber and I love the camera. I subscribe, and I would love to win this camera. I have always dreamed about owning a camera like this. i’d love to own this camera!! I subscriber and filled out my profile and would like to be entered to win the camera. Thanks . Thanks for the giveaway… Happy Holidays ! this is a great contest. i love the camera. This is the upgrade I’ve been waiting for! I am a subscriber, and would love a new camera!